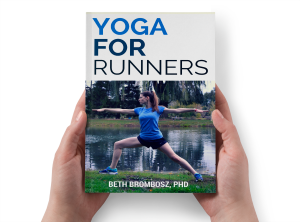 What’s one of the most common questions I get asked all the time by yogis and runners alike? “How long should I hold that yoga pose?” It makes sense that the length of a pose causes a lot of confusion: often yoga books, websites, and bloggers will simply show the pose (guilty!) and not share how long you should stay in the pose. 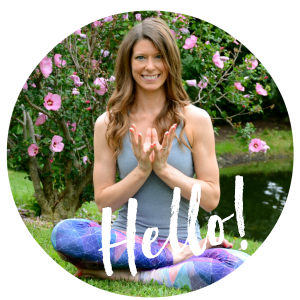 I hope this post helps to clarify some of the questions surrounding how long to hold yoga poses. I’ll let you in on a little secret: I think a lot of the time, when yoga teachers don’t always share how long to hold a pose when explaining it, it’s because there’s no one single answer. When you boil it all down, yoga should be about what feels right in your body. My yoga pose will look different from your yoga poses because our bodies are put together differently. Similarly, you may need to hold a pose for a shorter (or longer) period of time than I do to get the same benefits. Ask a #yoga teacher: How long should you hold yoga poses? When someone asks me how long they should hold a yoga pose, my usual response is, “At least three to five breaths, maybe up to 30 seconds, depending on what feels right in your body.” However, the length that we hold poses is going to vary a lot depending on what style of yoga we’re practicing. For example, in Vinyasa (flow) Yoga, yoga poses are strongly linked with the breath. 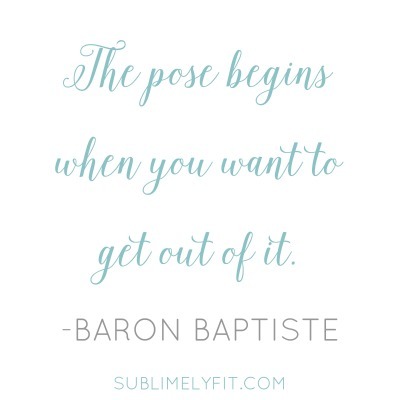 You may hold a pose just for an inhale or an exhale. That’s not a lot of time. But, the point of Vinyasa Yoga is to find a moving meditation, where you’re focusing more on just moving your body and dropping your thoughts. It’s less about the pose and more about how you feel mentally and physically. On the other end of the spectrum, you’ll see styles like Yin Yoga and Restorative Yoga. These styles will hold a yoga pose for three to five minutes at a time, sometimes even longer. The goal is to get your connective tissue to release, which takes a while to happen. So, using props to help support your body, you work to clear your mind of thoughts, breathe deeply, and relax into the pose. Yin and Restorative classes have very different vibe from a Vinyasa class, but that’s okay. One’s not better than the other; it’s all about finding what you need out of your yoga practice. So, How Long Should You Hold a Yoga Pose? 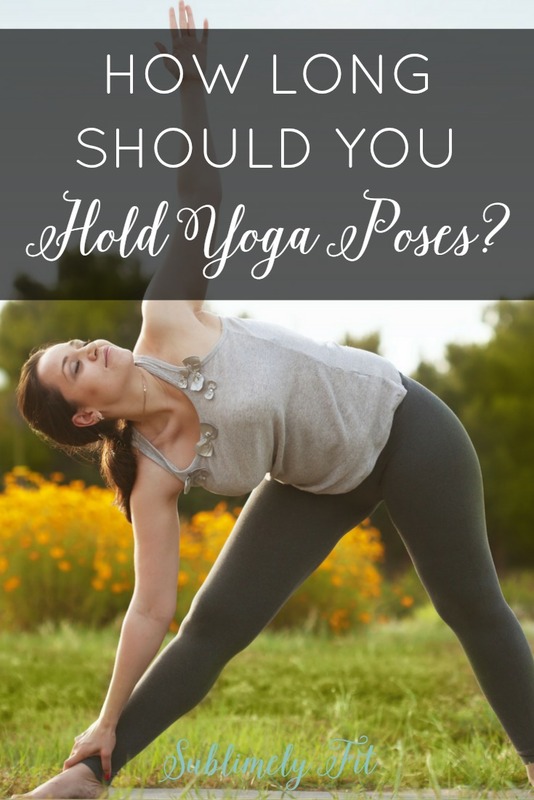 So, if there’s a lot of variation in how long poses are held, how long should you actually hold a yoga pose? My answer is always, “How long does your body tell you it needs to be in that pose?” If a pose feels really good and you want to stay there for a few more breaths, do it. This is also where yoga gets a little tricky. You build flexibility and strength by pushing yourself, but just a little. Baron Baptiste talks a lot in his books about “finding your edge,” which is a metaphor that I really love. We tend to stay in our safe comfort zones. But, sometimes you need to see if you can take a pose just a little further. The key to finding your edge is figuring out the difference between discomfort and pain. It can be tough to tell the difference between the two, but it’s what’s going to help you advance your yoga practice without getting injured. If you feel true pain, especially in your joints, you should back out. However, if the pose is simply a little uncomfortable, particularly if you’re in an intense pose like a big hip opener, you may want to stay in the pose a little longer. Ultimately, it all comes down to your goals for your yoga practice. If you’re looking to build flexibility, you might consider holding your poses a little longer, as long as it’s not painful. If you’re looking to advance your mental yoga practice, the length of the pose may not be as important. Just like anything in yoga, find what speaks to you and works for you. Love it! Love the quote. Great tips. It all circles back to listening to your body and honoring your space on the mat at that particular moment. We have such a hard time with being present and listening. If you spend more than eight hours each day sitting at a desk can be really dangerous for your health. Perhaps, you have experienced of back and should pain during work. So you should follow above mentioned yoga techniques to relief from back pain.